The Club has several annual awards that are presented at our Annual General Meeting. Click here for Membership Application. Click here for Breed Standard. Dog shows are more than just beauty contests. "Form follows function", as the saying goes. Click here for Obedience Official Entry Form. Click here for Retriever Field Trial Official Entry Form. 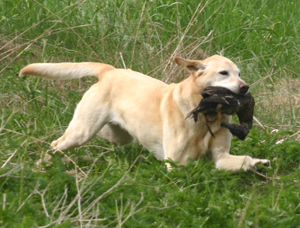 Click here for Retriever Hunt Test Official Entry Form. Click here for Working Certificate Official Entry Form. The working certificate is another way of testing the working ability of your dog. As with hunt tests the dogs are marked against a standard. The tests are designed to assess a dog's natural abilities such as marking, memory of fall, intelligence, desire, perserverance, nose and courage. There are three levels of Working Certificate Tests; the Working Certificate, the Working Certificate Intermediate and the Working Certificate Excellent. The dog only has to pass each set of tests once to receive the title. This is the basic instinct test. The dog may be brought to the line on a lead and may be held in heel position. The dog will be asked to make back to back land retrieves of between 50 to 75 yards and back to back water retrieves between 25 to 40 yards. The dog is not expected to deliver to hand. The dog is expected to come to the line without a leash or collar and must be steady. They will be asked to do a land double of approximately 75 yards and a water double of approximately 50 yards. They will be expected to do an honour on the land double. In this level the dog will be tested on a walk up land double or land and water double an honor on a walk up water double. They will also be tested on a land blind and a water blind the handler may wear white for the blinds, this assists the dog's ability to spot the handler, when looking for direction.